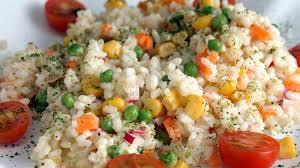 Ensalada de Arroz - Rice Salad - Tienditadepuertorico.com - Buy Puertorican Food Here!! skillet and saute the onion and pepper until golden brown. Let cool to room temperature. over the salad and toss.